Are you looking for the effective way to transfer data to iPhone XR, iPhone Xs, iPhone Xs Max, iPhone X or iPhone 8? Since Apple's iTunes only allows users to transfer the contents that you have purchased on iTunes, the other non-purchased files, like the internet downloaded music, photos, videos and etc. should be hard to transfer to your iPhone iPhone X/8. However, you have come to the right place here! Transferring data to iPhone XR/Xs/Xs Max/X/8 should be a piece of cake with the guide provided in this article. No matter you want to transfer data from old phone to iPhone X, or copy contents from previous phone to iPhone 8, or sync files from computer to iPhone X, or transmit data from old smart phone to iPhone 8, you can also make it very easily. Just keep reading to check it out! Only two steps are needed, and you can easily transfer the contents from computer to your iPhone XR, iPhone Xs, iPhone Xs Max, or iPhone 8. 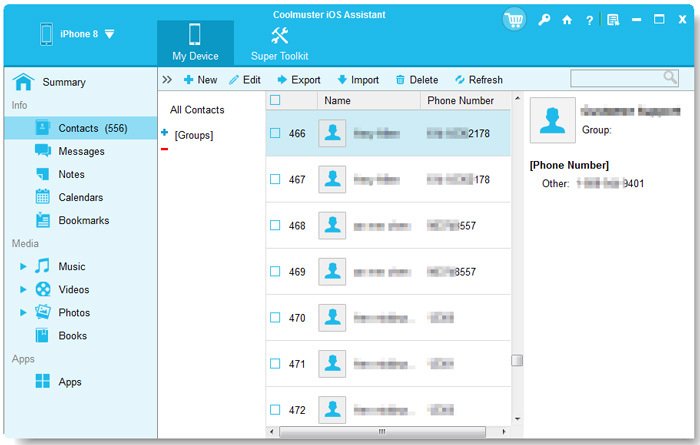 All what you need is the professional tool - Coolmuster iOS Assistant (Windows/Mac). 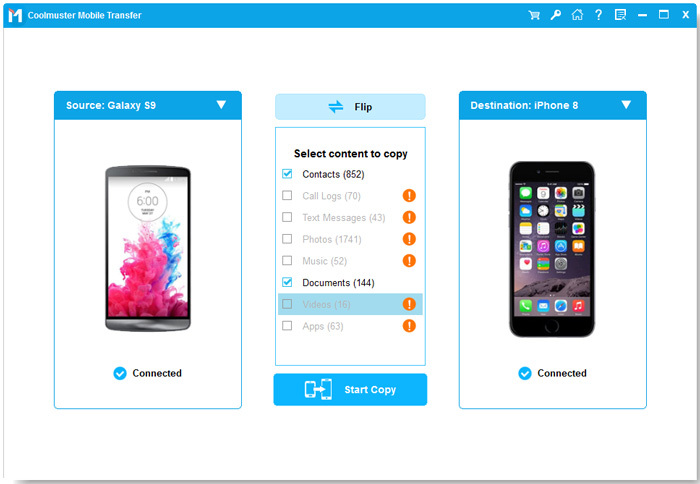 With it, you can transfer various types of files that from PC or Mac to your iPhone, including contacts, calendars, bookmarks and etc. iOS Assistant also can help you back up iPhone/iPad/iPod data to computer (take SMS as example to see how to back up iPhone text messages to computer), install/uninstall iOS apps, and even edit and manage iOS data on computer directly. Now, just download the free trail of the Coolmuster iOS Assistant on your computer, then you can start to transfer data from computer to iPhone XR, iPhone Xs, iPhone Xs Max, iPhone 8 or iPhone X with the guide offered as below. First of all, please connect your iPhone to your computer and then launch the installed iOS Assistant on computer. The software will automatically detect your connected iPhone, and show all the data contained on your iPhone in different categories. Note: Make sure you have installed the latest iTunes version on your computer. Otherwise the program will fail to detect your device. Then you can open each category from the left side menu to enter different file tab. Then, click the "Import" option from the top to transfer files from computer to iPhone. For example, to import contacts from computer to your iPhone, you can enter the Contacts file tab from the left side menu, hit the "Import" option from the top menu and navigate to the contact file you want to import to iPhone. After that, tap on "OK" option to confirm your action. Thus all the selected contacts will be transferred immediately from computer to your iPhone XR, iPhone Xs, iPhone Xs Max, iPhone 8 or iPhone X. Want to transfer contents from an old phone, no matter Android phone or iPhone, to iPhone XR, iPhone Xs, iPhone Xs Max, iPhone 8 or iPhone X? It is very simple, too. Only 3 steps is needed, you can easily transfer files from previous smart phone to iPhone. 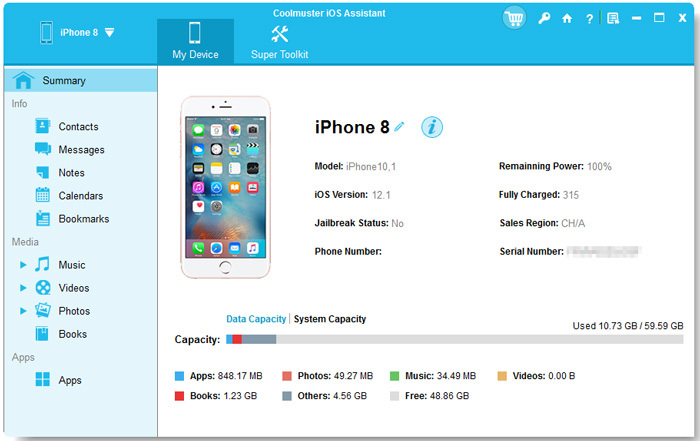 With the professional tool - Coolmuster Mobile Transfer (with its Mac version), you can not only transfer contents from Android device to iPhone, but also you are able to transfer data from any iOS device to iPhone XR, iPhone Xs, iPhone Xs Max, iPhone 8 or iPhone X freely. And different file types are supported by the software, such as the Safari bookmarks, calendars, contacts, notes, books and etc. Now, just download the free trail of the software on your computer, then follow the steps to transfer data from old phone to iPhone XR, iPhone Xs, iPhone Xs Max, iPhone 8 or iPhone X. After installing the software on your computer, please link your iPhone and the previous phone to PC with two USB cords. Then run the program, the two connected devices will be detected by this program. Then all the files on your phone will be shown in different categories, just check the file type tab to select the contents and then click the "Start Copy" option to begin to immediately sync the selected data from the old iPhone or Android phone to iPhone XR, iPhone Xs, iPhone Xs Max, iPhone 8 or iPhone X. For example, mark the "Contacts" tab and click the "Start Copy" button, you can transfer all contacts from your old phone to the new iPhone. Note: Please ensure that iPhone X or iPhone 8 should be placed on the Destination side. If not, just hit the "Flip" option to change the position. Make sure the two devices are connecting to the computer during the whole transferring process. 1. Open "Settings" on your old iPhone and choose the "Apple ID" banner. 2. Choose "iCloud" > "iCloud Backup" > "Back Up Now" to begin to back up your old iPhone data to iCloud. 3. Once the backup process is finished, turn off your old iPhone. 1. Turn on your new iPhone and after completing the initial iOS setup, you will be popped up with the option "Restore from iCloud backup". Just log into your iCloud account using your Apple ID. 2. Choose the file types that you want to restore from the iCloud backup. 3. Tap on "Start Copy" and all the selected data types will be restored to your new iPhone from iCloud backup. 4. When the process above is finished, you can directly click on "OK" to complete it. 1. Download the latest version of iTunes on your computer and launch it. 2. Connect your old iPhone to the same computer. Once it has been detected by iTunes, you can click on the iPhone icon from the left manu bar. 3. Tap on "Encrypt Backup" and add a password if it is your first time to encrypt a backup. After that, click on "Back Up Now" option. 4. Once the backup process is completed, you can unplug your old iPhone from the computer. 1. Turn on your new iPhone and connect it to the computer. 2. After you have set up your new iPhone, you should choose "Restore from iTunes backup". 3. Turn to the iTunes screen and choose "Restore from this backup". Then, find and select your "recent backup" from the list of backup records. 4. Click on "Continue" button and the restore process will begin. If your backup was encrypted, you need to enter the right password to decrypt it. 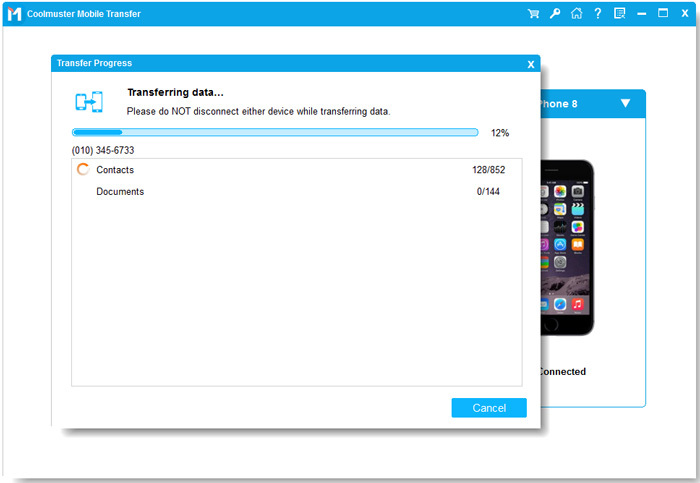 Other Questions About Transferring Data to iPhone? Above are four methods you can refer to transfer data to iPhone XR/Xs/Xs Max/X/8 from Android phone or old iPhone. If you have any problems or any other questions about transferring data to your new iPhone, drop them in the comments!